What are some alternative ways of fishing - i.e. catching fish? If I'm out in the wilderness and want to catch fish to survive, what are some ways I can do this without a conventional fishing pole/line? I like the native american fish trap (fishing weir). It's relatively easy to build if you have the right access to a stream. The basic idea behind this trap is to create a funnel that the fish follow into a trap that they cannot easily get out of. To build it, you simple stake off an area with small branches pushed down into the mud. 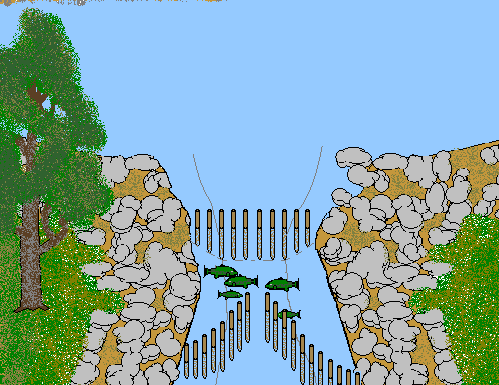 The water must be able to get through, but make sure the sticks are close enough to prevent the fish from coming through. Notice in the picture that the bottom set of sticks creates a funnel that fish easily follow into the trap. Once in there, it's very difficult for fish to find the one point where they can escape the trap. You can actually reach in to the water and grab the fish. No running or chasing. You just quietly get in position, and then when it's time, you quickly grab the fish. Thomas Elpel describes the process in his wonderful book, Participating in Nature: Wilderness Survival and Primitive Living Skills. The nice thing is that it requires no equipment. He says the technique is illegal in many places, because it is so effective that if widely used it would harm the fish population. In a survival situation, I would accept the legal consequences. Spearing is both viable and varies in legality within the U.S. Spearing during salmon runs has been done for centuries in the pacific northwest. "Darkhouse" spear fishing is popular on frozen lakes in the upper midwest and during the summer natives still spear for pike and walleye on many upper midwest lakes. One time in the Bihor mountains I watched a group of locals catch quite a remarkable number of fish by hand. They would walk upstream fairly fast running creek, two of them actually in the water, and several of them on the sides. The ones in the water would every once a while throw themselves down, scoop a fish with their hands and throw it to the bank, where the rest of the guys would immediately fall upon it and kill it with a hatchet. You can use a net to catch fish like you would do in an aquarium. Fastening a net at a strategic place in a rapid can, in theory, act as a fish trap, but I've never tried it. Trotlining is popular in the southern U.S. for catfish. It’s reminiscent of more commercial techniques and is a passive means of catching fish, where one sets out temporary rigs of rope along a several hundred foot area and then baits hooks every few meters, so that there are ~25-50 hooks in the water. Then it’s left for some number of hours and checked to see if it’s caught any fish. After fishing, the trot line is hauled up to avoid boats, swimmers or divers from getting caught in it inadvertently. Not the answer you're looking for? Browse other questions tagged survival fishing improvised-gear or ask your own question. What type of pole can be used for trout while backpacking? Went fishing on the river for full day, caught one fish; normal? Fish aren't biting, how to get more bites? Can ocean/saltwater fishing gear be used for freshwater/lake fishing? What are these fishing things called “Pre-rigged sets”? What advantage would noodling have over fishing with rod and reel? What tool(s) would be helpful for unhooking fish?